The relations of the settlers of Cherokee County with the Cherokees in the country were very friendly. Many of the Indians were professors of Christianity, and all were more or less under missionary influence. But early in 1836, the feeling of security was somewhat marred by the incoming of several hundred Creeks, who settled in an abandoned Cherokee village on South Spring Creek, about three miles distant from the residence of Rev. Mr. Anthony. 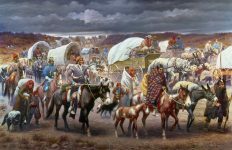 These Creeks claimed that they had left their nation because they did not wish to become involved in the hostility toward the whites then prevailing among a large portion of their people. The settlers and the Creeks for some apprehensions arose that the Creeks were meditating war. The whites at once gathered a force and time were on a friendly footing. But finally drove them out of their town, but not out of the country. Not long afterward, Gen. Nelson gathered these scattered Creeks, took them across Coosa River at Cothran’s Ferry, and thence moved them to their new homes in the west. Gen. Nelson is said to have acted tyrannically towards these unfortunate Indians in their removal, and in crossing Coosa River to have tacitly permitted low disreputable white men to inflict petty outrages upon them. Cherokee County was created by the Legislature January 9, 1836. Its territory lies wholly within the old Cherokee country, ceded by the treaty of New Echota, December 29, 1835. For a brief period after the cession, these lands were attached to St. Clair County for administrative purposes. It lost much of its western section by the creation of Etowah. then Baine County, December 7, 1866. The first officers, all appointed by the governor in 1836, were George Bridewell, judge of the county court; Robert Bell, sheriff; Henry L. Smith, clerk of the circuit court, and John S. Wilson, clerk of the county court. There was evidently dissatisfaction over the selection, for January 15, 1844, James Montgomery, Magnus G. Williams, Andrew J. Copeland, Thomas Garrett, Joseph Wharton, Aaron Clifton and Asa R. Brindley were appointed commissioners to ascertain the center of the county and to certify the point selected to the sheriff. An election was then held on the first Monday in Apri 1844, at which Cedar Bluff and the central point so selected were voted for. 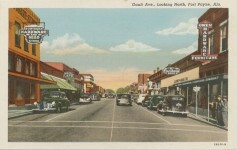 Cedar Bluff lost in the election, and the name Center (Centre) was applied to the new location. 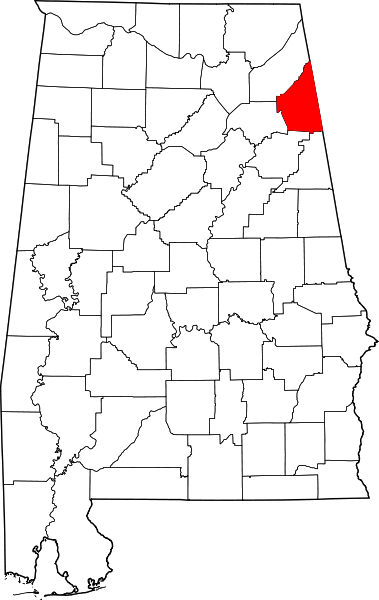 Cherokee County is located in the northeastern section of the state of Alabama. On the north it is bounded by DeKalb County, on the east by the State line and Chattooga and Floyd Counties, Ga., on the south by Cleburne and Calhoun, and west by Etowah and DeKalb Counties. It lies largely in the western division of the Appalachian Province, and has many of the marked characteristics of that geographical area. These characteristics consist of broad, level plateaus, and alternating with narrow valleys. 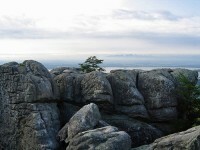 The character and position of both the plateaus and the intervening valleys are closely connected with the character and structure of the underlying rocks. The elevations and the valleys have a northeast and southwest trend. To the northwest is Lookout Mountain. Shinbone Ridge and Tucker Ridge lie wholly within the county. The intervening area is known locally as Broomtown Valley. The Coosa River flows through entire extent of the county. Its principal tributary streams from the north are Chattooga and Little Rivers, and Yellow Creek. The streams flowing from the south are Spring, Cowan, and Terrapin Creeks. The county from the earliest Native American period seems to have been the home of the Cherokees. Evidences of Indian life are found all along the Coosa River. The caves or rock houses on Little River must be ascribed to them. The Cherokees were known to other branches of the Iroquois as “people of the cave country,” and the meaning of the tribal name carries the same suggestion. The territory was first visited by De Soto in June, 1540, when he entered the town of Chiaha, now supposed to have been situated on McCoy’s Island, near Cedar Bluff. The Indian burial places below the bluff, reported in later years, are doubtless referable to that town. The De Soto chroniclers assert that they passed through many towns, and traces of them are yet seen. Turkey Town, named for a noted chief “The Turkey,” is the only modern Cherokee town known to have existed in the county. It was founded about 1770 and was situated in the bend of Coosa River opposite Center. It was an important place and there, under the leadership of “The Turkey,” originated many inroads into Tennessee and Kentucky. A Cherokee, of a type totally different from the cruel leader just named, was Rev. Thomas J. Meigs, a Cherokee Methodist minister, who, at a later day, lived in the county, and who labored long and faithfully for the permanent interests of his people. The white settlers on coming into the county in 1836 found many of the Cherokee’s professors of the Christian religion. 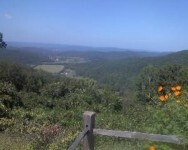 The Cherokees migrated west in 1838. 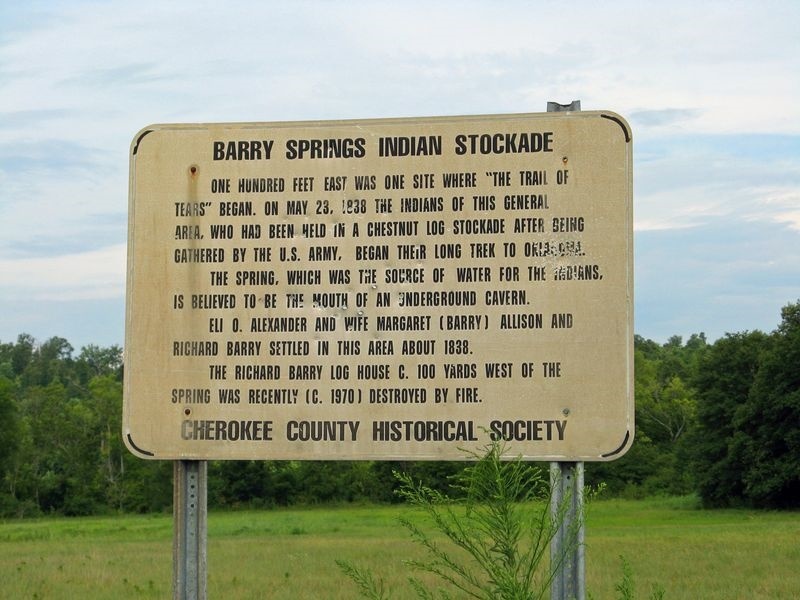 Barry Springs is located in the northern part of Cherokee County and is named after Richard Barry who settled there around 1838. There is a large spring at the site that feeds into Mill Creek which runs through the property. When the removal of the Cherokee Indians began in April 1838, United States troops built three removal forts in Alabama. Fort Payne was built in Dekalb County. The other two forts were built in Cherokee County. The first settlers found their way into the county in 1835, before the Cherokee title was extinguished. In the fall of that year, the Rev. Whitfield Anthony with his family came with a party from South Carolina, and settled on the south side of Coosa River, three miles to the west of the mouth of Mud Creek. Others of the party settled at convenient places south of the river. This South Carolina party was composed of forty persons. The names of some of the early settlers of the county were Ambrose Vandever, Hezekiah Day, Thomas Miller, William Cozart, Mrs. McCoy, Absalom Reagan, Mr. McWright, John Lay, Col. John Cothran, Maj. Sam Martin and Rev. John Holmes. The settlers had to endure the usual privations incident to frontier life. Owing to the lack of mills they were forced to carry their corn to Georgia to be ground. With the advent of Methodist, Baptist and Cumberland Presbyterian ministers, church houses were built, churches organized, and soon the morals of the country were improved, deer hunting on Sunday and other irregularities coming to an end. The Rev. Mr. Anthony was greatly instrumental in bringing about these changes. In 1836 a camp ground was established near Gaylesville, called Sulphur Springs, where religious meetings were held. The Cherokees in large numbers attended these meetings. 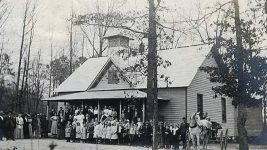 The first school in the county was taught by William Kincade, and the second, by Ellas Spann. During the Civil War, Cherokee County provided 15 companies of infantry and two cavalry units to the Confederate Army. The Nineteenth Alabama Calvary was composed almost entirely of Cherokee County volunteers who fought under General Joe Wheeler. The area became a major supplier of iron ore to the Confederacy during the war. 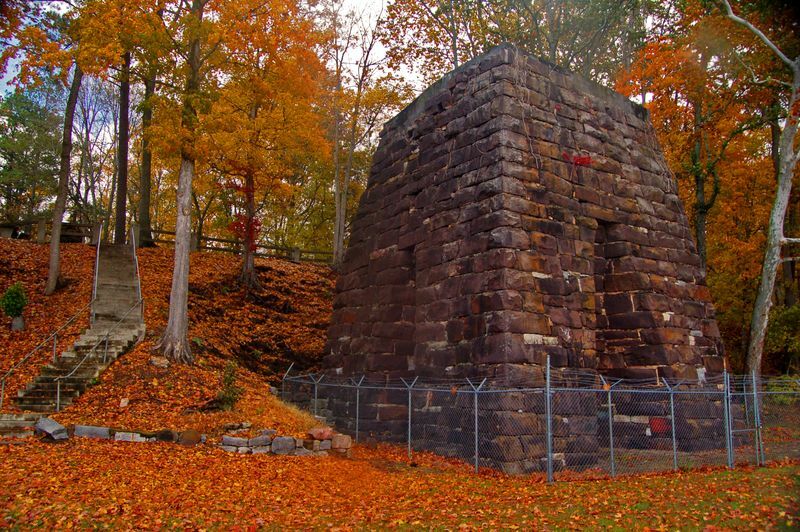 Stroup Furnace at Round Mountain and Rock Run Furnace were both destroyed by the Union Army but were reopened after the war. The first Confederate Cannon was made in Cherokee County, Alabama. The Noble Brothers operated an iron foundry in Rome, Georgia and the Confederate State of America provided the financing to build the furnace. The Noble Brothers signed a contract with the government in August 1862 and construction of the furnace began shortly thereafter. Constructed of limestone from the nearby Coosa River, the 35-foot-high furnace was the first to supply iron for the casting of Confederate cannons during the Civil War. It went into production in either late 1862 or early 1863. The furnace used water power from the nearby Chattooga River to power the blast. The pig iron ingots manufactured at the furnace were sent to the Noble Brother’s foundry in Rome, Georgia for the manufacture of war materials. Union General William Tecumseh Sherman twice ordered the furnace destroyed in 1864, but it still stands in its original location. Co. C, “Cherokee Greys,” 7th Regt. Co. D, “Curry Guards,” 19th Regt. Co. E, “Cherokee Guards,” 19th Regt. Co. F, “Davis Guards,” 19th Regt. Co. G, “Cherokee Mountaineers,” 19th Regt. Co. H, “Cherokees,” 19th Regt. Co. I, “Cherokee Rangers,” 19th Regt. Co. D, “Cherokee Beauregards,” 22d Regt. Co. B, “Ralls Rifles,” 31st Regt. (Sometime called Co. C.). Co. G, “Elisha King Guards,” 48th Regt. Co. H, “Cherokee Greys,” 48th Regt. (Formerly Co. C, 7th Regt., supra). Co. B, “Cherokee Davis Guards,” 55th Regt. Co. K, 55th Regt. (Formerly Co. D, Snodgrass’ 16th Inf. Battn.). Co. B, “Russell’s 4th Regt.” (Formerly Co. E, Forrest’s Tenn. Cav. Regt.). Co. G, 12th Regt. (Formerly Co. G, 12th Cav. Battn., which Co. appears to have been a remnant of Co. E, 1st Cav. Regt.). 1839-40—George Clifton; Samuel -D. J. Moore. 1840-1—John H. Garrett; W. H. Hale. 1841 (called)—John H. Garrett; W. H. Hale. 1841-2—John H. Garrett; William Henslee. 1842-3—Thomas B. Cooper; J. H. Hendrix. 1843-4—William H. Garrett; J. M. Hendrix. 1844-5—William H. Garrett; Thomas B. Cooper. 1845-6—William H. Garrett; F. M. Hardwick. 1847-8—William W. Little; F. M. Hardwick. 1849-50—Thomas B. Cooper; F. M. Hardwick. 1851-2—Thomas B. Cooper; John S. Moragne. 1853-4—James M. Clifton; G. W. Lawrence; Henry C. Sandford. 1855-6—E. G. Bradley; Samuel C. Ward; Henry C. Sanford. 1857-8—Thomas Espy; L. M. Stiff; A. G. Bennett; W. R. Richardson. 1859-60—Thomas B. Cooper; James M. Clifton; F. M. Hardwick; Dozier Thornton. 1861 (1st called)—Thomas B. Cooper; James M. Clifton; F. M. Hardwick; Dozier Thornton. 1861 (2d called)—William W. Little; A. Snodgrass; A. R. Brindley; John D. Miller. 1861-2—William W. Little; A. Snodgrass; A. R. Brindley; John D. Miller. 1862 (called)—William Snodgrass; A. R. Brindley; John D. Miller. 1863-4—Thomas B. Cooper John Brandon; W. A. Vincent; G. W. Howell. 1864-5—Thomas B. Cooper, John Brandon; W. A. Vincent; G. W. Howell. 1865-6—Thomas B. Cooper; J. W. Brandon; John Potter; John Lawrence. 1866-7—Thomas B. Cooper; J. W.. Brandon; John Potter; John Lawrence. Inspired by real people and actual events, the family saga of colonial America continues with Ambrose Dixon’s family. Faith and Courage presents the religious persecution of Quakers in Pre-Revolutionary War days of America intertwined with a love story. In this action packed novel, George Willson witnesses the execution of King Charles II and is forced to leave the woman he loves to witch hunters in 17th century England as he flees to his sister, Mary, and her husband Ambrose Dixons home in Colonial American. Ridden with guilt over difficult decisions he made to survive, George Willson and the Dixon’s embrace the Quaker faith which creates more problems for their survival in the New World. The video of Amazing Grace sung in Cherokee language was beautiful! Yes! Big government killed them off… But hey! Let’s name this after them? You are right,the Song Amazing Grace is beautiful and sad I love it. Benjiman Bridges Whorton was born in Turkey Town in 1817 and the first settlers came from South Carolina in 1835? Also, saying the Cherokee “migrated” west is a bit of a whitewash of the facts don’t you think? I live in Pickens Co, GA not far from New Echota, the seat of the Cherokee Indian government. Sh don’t mention it somebody want you to change Cherokee County name…..like RedSkins..
Rachel, do you still sing this? Read about our county we moved to. A lot of history here. A lot of Cheokee County History. A sad day in history. I hear you girl! Sad! So called whites are the original slaves. Slavic slaves. The Cherokee Indians,And blacks are my ancestors, My heritage, We both have a reason to whine.It hurts my heart daily to think and know about it.There is a problem if you think one mattered over the other one. All of it was and is wrong. Always happy to see anything about the Cherokee. My maternal ggrandmother was Cherokee–her family moved to Alabama from Georgia before Civil War. Cherokee is not the ancient name of the people. It’s a new made up name created for white slaves and peasants. Seminole means runaway in Creek. If your ancestors weren’t Maroons, you aren’t a Seminole. Just finished reading “Jacksonland” which details the relationship and historical events surrounding President Jackson and the Cherokee Nation and their eventual removal from the south. Recommend highly. Don’t think as much of Jackson as I did before reading this. My Cherokee relatives of Cherokee Co and Clay Co NC mostly managed to avoid relocation. More people died in the stockade than on the Trail of Tears. Check it out. Cherokee County had another stockade at Ft. Lovell, somewhere in the Cedar Bluff area now under water. Cherokees were also marched from Turkeytown in Cherokee County. Jim Lewis is the historian for the Historical Preservation Society, Cherokee County, AL and has been working on a very impressive TOT display at the Cherokee County Historical Museum. He has a large collection of information on this subject at the Museum as well. Go to Welcome to Cherokee website for future updates on this and other Cherokee County history. 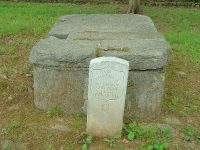 My name is Jim Lewis, Cherokee County Historian.You have a lot of misinformation about the furnaces and first Confederate cannon. It is unfortunate that once this misinformation is made public, it is like releasing the genie from the bottle, once released, can’t be put back in. Thank you for your comment. I listed the sources for the information with the article and did not realize it was inaccurate. Much of it came from Wikipedia so that is probably why. I can post any corrections you would like to make under the article. That way people can see both the inaccuracies with the correct information. Shinbone Ridge does not lie “wholly” in Cherokee County. I could see it out my mother’s kitchen windows, and we lived in Etowah County. It actually runs all the way down to Gadsden. My Phariss and Bankson ancestors moved into Cherokee County during the 1840’s-1850’s. Donna, Please check the information and the sources you are putting on your website and make sure the information posted is correct. Having been a teacher, you must realize how misinformation posted on this site will be quoted by other researchers. Rock Run Furnace was not built until after the Civil War. There were no confederate cannons made in Cherokee County. Almost all of the Cherokee Indians rounded up in Cherokee County were sent to Ross’s Landing in Chattanooga. Near the end of the roundup, about 20 Indians were sent directly to Fort Payne. Please be more responsible in checking your articles for accuracy before putting them on your website. Everyone makes mistakes, but if the information cannot be determined to be factual, it should be stated what source you are deriving you information. Thank you for your comment. Most of the sources for the story are listed at the end. Scroll down the page to see them. There are also links within the story about Rock Run that take you to articles written by Hugh Cardon. I assumed he was a good source since the following was stated about him. In this article, he states the following. The first Confederate cannon was made by Noble in Rome, from iron drawn from the hills of Cherokee County and smelted at Cornwall. This furnace was destroyed by Gen. Blair in 1864 but was rebuilt by Col. Rattray. Should Historian Hugh Cardon not be used as a reliable source? Also, I don’t understand the confusion on the Native American stockade at Barry Springs.